K1 and K2 line arrays support “I Am the Highway: A Tribute to Chris Cornell” fundraising concert held at the Forum in Los Angeles. 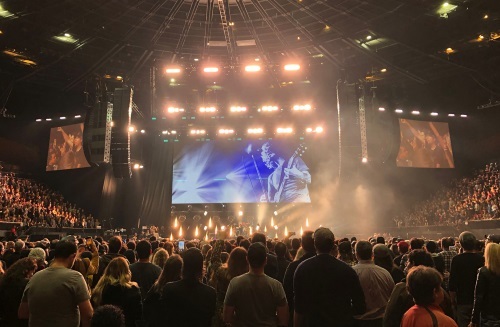 Rat Sound recently deployed L-Acoustics K1 and K2 line arrays for the “I Am the Highway: A Tribute to Chris Cornell,” a fundraising concert held at the Forum in Los Angeles. The five-hour show was anchored by extended sets from members of three of the bands that Cornell fronted—Soundgarden, Temple of the Dog, and Audioslave—and featured performances by Metallica, Foo Fighters, The Melvins, and others. Hosted by Jimmy Kimmel, the show also featured an extensive list of guests, including Jack Black, Brad Pitt, Brandi Carlile, Fiona Apple, Josh Homme, Miley Cyrus, Adam Levine, Chris Stapleton, and Ziggy Marley, who all paid tribute to the beloved musician that suffered from depression, which led him to take his life in May of 2017. Rat was honored to be asked to participate in the benefit and has a long history of working with Soundgarden, dating back to the band’s tour with Danzig in 1990. The Camarillo, California-based company handled audio production, which included an L-Acoustics K1/K2 line array system with KS28 subs, together with five DiGiCo and two Avid mixing consoles plus an Avid multi-track recording rig. Rat Sound spent three days at the venue and fielded 15 crewmembers to handle setup, onsite rehearsals, and the show. 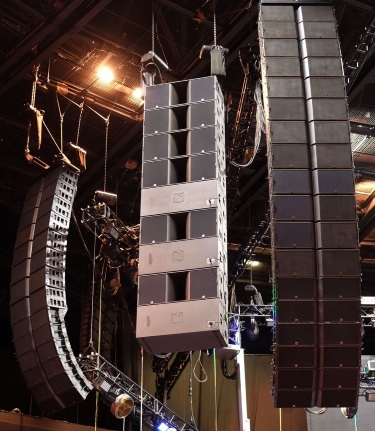 The L-Acoustics PA comprised, per side, 12 K1 arrays over six K2 for the main hangs and eight K1 over four K2 for the side hangs. Thirteen additional K2 per side provided coverage out to 270 degrees in the sold-out arena, which seats nearly 18,000. Rat Sound also flew nine KS28 subwoofers in a cardioid configuration per side, supplemented by another 20 KS28 subs on the floor. Eight ARCS II and eight Kara II cabinets provided front fill. A stage thrust offered space for acoustic ensembles and soloists to perform while the backline was being changed over for the main bands on the turntable stage behind them, says Worley. “We had some L-Acoustics X15 HiQ wedges across the front of that thrust that handled all of the acoustic acts,” he says. Sidefill on either side of the main stage comprised two ARCS II and a pair of KS28 subs. “It’s a nice configuration with a low profile, so the promoters liked it,” Worley says. DiGiCo SD12 consoles at front of house and the stage were used to mix the acoustic acts as well as the production elements, such as the host mic and video segments played between performances. One of the night’s highlights was Ryan Adams performing Cornell’s “Dead Wishes” and Soundgarden’s “Fell on Black Days” on acoustic guitar with several string players, including Don Was on acoustic bass, Worley reports. The Melvins, who kicked off proceedings with a five-song set, ending with Soundgarden’s “Spoonman,” and Audioslave, with guests such as Foo Fighters’ Dave Grohl, Metallica’s Robert Trujillo, Geezer Butler of Black Sabbath, and Chris Chaney and Perry Ferrell of Jane’s Addiction, played through an Avid Profile at front of house with a second Profile for monitors. Worley managed signal routing across the complex system using Outline’s Newton multi-source, multi-format audio processor and matrix mixer, which Rat Sound has recently adopted for festivals and similar large events. “We were looking for something that was bullet-proof that sounds good and is very simple and easy to use,” he says. Soundgarden brought the night to a close with an eight-song set that saw the likes of Peter Frampton, Taylor Momsen, Marcus Durant, Tom Morello, Wayne Kramer, Taylor Hawkins, and Buzz Osbourne, among others, rotate in and out of the lineup. The concert was the first time that Soundgarden’s surviving members—guitarist Kim Thayil, bass player Ben Shepherd, and drummer Matt Cameron—had performed together publicly since Cornell died while on tour with the band. Thayil and Shepherd gave Cornell an emotional final send-off with an intense, extended blast of feedback at the end of “Black Hole Sun” that hung in the air long after they had left the stage. Proceeds from the concert were split between the Chris and Vicky Cornell Foundation, which was established by the singer and his wife to protect and provide for vulnerable children worldwide, and the Epidermolysis Bullosa Medical Research Foundation.